[15-Oct-2017]: Updated the installation steps and web portal configuration steps to support pfSense v2.4. I wanted to build a virtual lab environment at home that would emulate an office environment. My requirements were to have separate network segments for Clients & Servers, and two DMZ networks. I also wanted my home network, which is external to the virtual lab environment, to emulate the Internet, even though it really isn’t. VMware Workstation has a feature called LAN Segments. 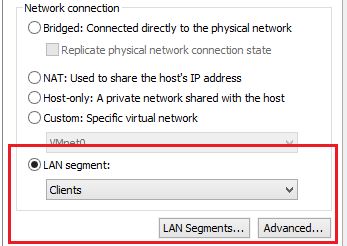 LAN Segments are a great way to create private virtual networks for any number of uses, but keep in mind that you cannot use Workstation’s DHCP features with LAN Segments. This means you become responsible for defining a LAN segment’s IP addressing by configuring static IPs on the VMs connected to the segment, and if you want to connect multiple LAN segments together, you need a VM that can provide routing between the LAN segments. The following is how I created multiple “named” LAN segments within VMware Workstation, and routed between them using a VM running pfSense, which is an open source firewall. My lab PC is a tower with a single physical NIC connected to my home network (Home-Net), which uses an address space of 192.168.199.0/24. I reserved 192.168.199.101 – 192.168.199.110 for my lab environment to use as external “public” IPs, and I made sure my Home-Net DHCP service was not giving out IPs in that range. The upstream gateway is the router/firewall shown in the Home Network section of the above diagram. This configuration allows lab VMs to access the Internet through the pfSense firewall. All network traffic leaving the lab that is not assigned a NAT IP within pfSense will get sent out using the IP of the WAN interface (PAT). The below table outlines the IP address plan for each of the lab’s network segments, and includes the pfSense interface names along with the IP addresses that will be assigned to each pfSense interface. The first row shows pfSense’s WAN interface, which as discussed above, will be bridged within VMware Workstation to Home-Net. If needed, use 7-Zip to extract the ISO from the archive file. From within VMware Workstation, open the settings of any existing VM, and select the VM’s network adapter. 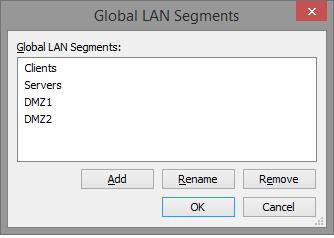 Click on the LAN Segments button, add the following segment names, and click OK. Note: After installing pfSense and doing the initial configuration, these instructions finish the configuration via the pfSense web portal. To follow along, you will need a Windows or Linux VM so you can connect to the web portal with a browser (Firefox, Chrome, Edge, etc.). Or allow the timer to expire. Disconnect the ISO image file from the CD/DVD drive while rebooting, and wait for the prompt to configure the WAN interface (em0). After assigning the WAN interface, pfSense will configure itself. When it’s done, you’ll be presented with a list of options. Directly above the list you’ll see the configuration for the WAN interface. If you have DHCP enabled in your home network, the WAN interface will get an IP address, but we will assign a static IP later. Power off the pfSense VM (Halt System). Repeat adding a new vNIC for the Servers, DMZ1, and DMZ2 LAN Segments. Power on the pfSense VM, and wait for it to boot. Note the listing of interface names and their MAC addresses. They should match up accordingly. Note: If you’re building your lab in a laptop that will be connecting to various networks, you’ll want to skip this step, and just let the WAN interface get its IP address configuration from DHCP. You will also want to change the VM’s vNIC setting from Bridged to NAT. The IP address for the LAN interface becomes the URL for the web management portal (webConfigurator). First time logging in? pfSense has a wizard that you can go through. I prefer to skip this by clicking on the logo in the top-left corner. In the pfSense VM settings, make sure the MAC address of the Clients vNIC matches up to the MAC address shown for the em1 interface. In the pfSense console, use option 1 and/or 2 to reconfigure the WAN & LAN interfaces. Make sure the vNIC for the Windows/Linux client VM is assigned to the Clients LAN Segment. If needed, start over by shutting down the pfSense VM, opening the VM’s settings, and re-adding all of the vNICs, or try generating new MAC addresses for each vNIC. Click the pfSense logo to skip the configuration wizard. Verify the settings, and if needed, make changes. Click Apply Changes to reset the WAN interface so it can use the DNS settings made on the General Setup page. Wait for the Success message in the log window before continuing. Edit the admin account and set your own super-secret password. The reboot is needed to initialize the Open VM Tools. These rules are configured with a lab environment in mind. By default, pfSense allows anything connected to its LAN interface (Clients LAN Segment) to access the WAN (Home-Net & Internet), and all of the other network segments. We will create rules that can block the Clients network segment from accessing the WAN and other networks, but we will leave them disabled. They will be there just in case it’s needed. We will also allow any Home-Net IP address to ping the WAN address. This can help with troubleshooting. Click the Garbage Can icon in the “IPv6 *” Default allow LAN to any rule to delete it. Click the Copy icon in the rule you just created to create a new rule based off of that rule. No Rules. You can build your own as needed. Click on the States (tab). You should see an entry for the VM connected to the pfSense web portal. At some point you will want to use the other IPs you reserved on Home-Net (192.168.199.102 – 192.168.199.110) for exposing a lab VM’s services. For example, you build a Web server or Reverse Proxy in DMZ1. Note: If you built your lab in a laptop, and you configured the pfSense WAN interface to get its IP configuration using DHCP, be careful with your choice of virtual IPs. You don’t want to cause an IP conflict on the external network. You’re going to map the external Home-Net virtual IP address you created above to the IP address of the internal lab VM. This rule will allow you to ping the internal lab VM using the external Home-Net virtual IP address you configured above. At this point, you’ll want to build some servers and clients to use the LAN Segments you configured in VMware Workstation. 2-3 clients with various operating systems. Windows Domain Controllers or Linux Samba servers configured as DCs. A DHCP server for the Clients network. An NTP server to be an authoritative time source for your internal servers. A DNS server in DMZ1 to provide external DNS services to external client machines in Home-Net. A Microsoft Exchange 2013 environment with a CAS proxy server in DMZ1. A Microsoft Lync 2013 environment with an Edge server using DMZ1 & DMZ2. A reverse proxy server using DMZ1 & DMZ2 in front of a Microsoft SharePoint environment. Add another LAN Segment to VMware Workstation, and use it for replication between a cluster of Exchange mailbox servers or Microsoft SQL 2014 servers.